What most of us were not aware of, was that this new commander had in fact spent a great deal of time in the Middle East some years before. This new man? 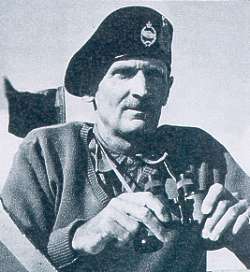 Lt. General Bernard Law Montgomery. Unfairly or otherwise, this was the attitude most of us forward troops had towards this new commander. He just wasn't one of us; Yet! Firstly he had to prove himself. Unfortunately he hurt himself when he addressed many of us in the field. His attitude seemed to be so overbearing. He appeared to be 'putting us down' and various comments he made about some of our previous actions, left no doubt about the little respect he held for some of our present and former commanders. He appeared to be the Great I am, for it was I this, I the next thing and very little of we or us. We therefore felt the loss of General Gott even more. I might go as far as to suggest that our loyalty to our former commanders was even greater than before. Now in all fairness no one knows just how good a Commander General Gott would have been at Army level as he didn't have the opportunity to prove himself. Now I'm sure that it wasn't Monty's intent when he addressed us, however his immediate orders to replace certain high ranking officers, helped to feed the flames. His intention we learned later, was to try to raise the morale of the forward troops which, in his opinion, was at an all time low. We troops, however, had no idea of this so called low morale problem and I would reiterate that the content of those addresses had the opposite effect to that which he desired. His very first order went against everything we had been taught and had trained for and practised throughout the war up to then (and we had taken part in some excellent successes.) Authors of subsequent books, have written that the arrival of Montgomery in the desert was greeted with great enthusiasm by the troops, but the removal of our commanders and the changing of various orders didn't endear him to many of the 'older hands'. We learned that we were to be part of a defensive action between Ruweiset and the Alam Halfa Ridges and were told that our function would be to entice the enemy forward: regardless of what happened, we were not to engage him. 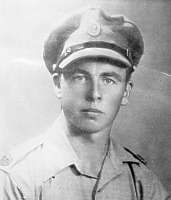 As a member of the 7th Support Group, I provided Rear Link Communication between the Battalion of the Rifle Brigade under command of Lt. Col. Vic Turner and Support group H. Q. Now that order didn't go down too well with most of us for it was something we had never done, turn tail and run. We had always stood and fought for as long as we could before fighting a strategic withdrawal action. But being soldiers, we obeyed. We were located between two low ridges about 8 miles south of Ruweiset and about the same distance SW of Alam Halfa Ridge, with the 8th Armoured Brigade and the 7th Armoured Div., some 5 miles to our rear or (to the East). During the night of the 31st August, the enemy sent his 90th Light Division in our direction and to their south the main thrust of the DAK. We saw them coming, they in turn saw us, as they were supposed to. We allowed them, in fact encouraged them to advance by making ourselves a prime target which they immediately engaged. We as ordered, turned and ran, hiding in whatever protection we could find, thus we found ourselves wedged between the 90th Light and their main thrust as both turned northwards towards El Alemein, in other words we were completely surrounded by the enemy. What most of us weren't aware of, was that false maps of the area had been allowed to fall into enemy hands which indicated certain routes between the Qattara Depression and the two ridges as being 'safe', whilst others were dangerous, meaning soft and treacherous sandy going. This ruse worked causing many of their Tanks, Field Guns and Vehicles to become 'bogged down' in the soft sand and we were trying to find a safe place in whatever craggy places we could hide. The advance into that area was part of Montgomery's plan to give Rommel 'what for'. Our Armoured Troops then came forward and engaged the enemy who after a few days fell back. We were then given the order to engage those in our area. We didn't need much persuading and did so with great gusto. We realised that we had in fact been used as bait and regardless of the outcome didn't like it one little bit. The enemy lost 50 tanks, we 68. There were 3,000 Axis casualties, we suffered 1,500. He lost 58 guns to our 18. Statistically we were the victors. Upon retreating he was allowed to retain possession of some high ground which we learned much later was also part of Monty's plan to allow the enemy to observe certain scenes of activity behind our lines meant also to deceive him. Another ruse which had success. The Battle of Alam Halfa isn't too well known, but was in fact a very important one, mainly because the enemy lost the last chance of breaking through to Cairo and the Suez Canal. It also gave us a chance to build up stores and equipment. Even more importantly a chance to train new arrivals and allow them an opportunity 'to get their knees brown'. It also proved that the Air Force and Army could work well together and I suppose to a certain extent it did serve to raise the morale of those in action for the first time as they took part in a victory. Speaking as one of the forward elements, although we didn't like the idea of being used as bait, we had to grudgingly admit we had a commander who was efficient and had knowledge and skill. However, this one battle didn't endear him to us, he still 'had to get his knees brown'. It was and still is our opinion there was more than one Battle of El Alamein and Alam Halfa was the first. IT WAS THE 23rd OF OCTOBER 1942. The place, a 32 mile stretch of desert about 60 miles west of Alexandra to the soft sands of theQattara Depression in the south. The desert to many newcomers seemed like a very hostile place, but not to those who had become well seasoned Desert Rats long before the start of hostilities in North Africa. We had learned to accept it for what it was, we didn't try to change or adapt it to suit our needs, but rather, lived with what it offered. We grew to know it's little whims and tricks. We made it our home. We were awakened about 5 a.m. with - "Stand To!" It was dark, as it usually is at this time of year in the desert. Many men wore their greatcoats, others threw a blanket over their shoulders to ward off the chilly air. One could hear the usual grumbling about the merit of 'standing to' every morning and night and this brought the shout "Put a sock in it!" Some chaps lit up a cigarette and this brought "Put out those fags!". Then came the usual advice, "Keep a sharp lookout for Jerry chaps, he might surprise us this morning." When the sun started to rise, it signalled STAND DOWN and the start of the day's activities. Breakfast for some meant fat greasy bacon, porridge, bread and jam and for those not so lucky, it was the usual Bully Beef and Biscuits and of course the ever ready hot sweet strong Tea. With the sun and the breakfast came the never ending scourage of the desert - the flies. They came in their millions, trying to get into the eyes, noses, ears and mouths of the men, anywhere they could find moisture. The infantrymen made themselves as comfortable as they could in their narrow slit-trenches, which gave a certain amount of shade from the hot daytime sun, but was of little help with the fly situation. Rather the reverse and the cramped positions in the slit-trenches didn't help much either. Activities were kept to a minimum and what there were was under cover. 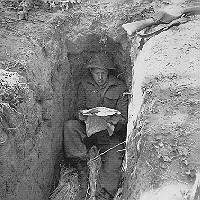 In the slit-trenches the men looked at their watches, checked and rechecked their weapons and equipment and kept an eye open in the direction of the enemy lines. They repeated this procedure over and over again. During the afternoon, the desert changed it's character: it was time for it's little display. Today it was the 'sand devils', a type of twister which blew loose sand into the eyes, noses, mouths and even the ears of the men and got into cracks and crannies of everything not completely sealed. Further back at the gun positions, the gunners were a little better off for being in gun pits, they had more room to move around, but even here it was check and recheck and keep under cover. As usual in the desert, twilight fell very quickly. It was the time when the whole Desert Force seemed to come alive. The transport columns started to wind their way to the front from the rear over the various tracks, Sun, Moon, Star, Springbok, just to name a few, raising as they did, clouds of choking dust which completely blackened out the sky. Each evening they brought up fresh supplies of food, petrol, ammunition, odd items from the canteen, letters, replacements and for some an ever welcome hot evening meal. Supplies unloaded, the men sat down to eat. Those with letters read them very, very slowly, absorbing each precious word. Then it was back to check and recheck, check and recheck and keep under cover. Some of the replacements were told they would not be needed and when asking the reason, were told they would find out soon enough. By now, the dust had settled and the moon was exceptionally clear amongst millions of stars. At the gun positions, final checks had been made, some men took off their jackets, others removed their shirts, for they knew that before the night was over, they would be wet with sweat as they were to be part of a very large Battery of 882 field guns which were to lay down a barrage of shells not seen since WW1, and those guns still able to fire in the morning, would have fired more than 600 rounds each. At 9:30 p.m. the preliminary orders were given and at 9:39 p.m. the gunners were told to "take post". Meanwhile in the forward areas, the infantrymen were waiting with bayonets fixed, ready for the order to advance. With them, men of the Royal Engineers, the Corps of Military Police and Royal Corps of Signals, all part of the Mine Clearing Squads. At 9:40 p.m. the command "Fire" was given. The whole area seemed to light up and explode into a ball of fire from the sea to the Qatarra Depression. The sky lit up like an elongated ball of flame as each round left the guns and another flash helped to keep that flame alive. Everyone except the gunners stood with their mouths wide open, wondering how anyone could remain alive through such a barrage. As the guns were rumbling, the supply columns were making their way back to B Echelon and beyond and some were actually passing the guns when they opened up, scaring the daylight out of the drivers and passengers alike. Now the chaps who had been told they wouldn't be needed this evening knew the reason why. It was no longer a secret. Suddenly, there was silence! Our guns had stopped firing. The combined efforts of the Army, Navy, and Air Forces had effectively kept the enemy from replying. And they were still silent. At the gun positions, new commands had been given. The gunners knew that this time they had better be smack on target, as their infantry colleagues would be going forward under the next barrage of shells. The Infantrymen now left their slit-trenches and were nervously waiting, everyone alone with his own thoughts. Many expressed out loud, "Thank God I'm not on the receiving end of this lot." They looked at their watches, for some, time seemed to stand still, for others it went far too quickly for they knew that when our Artillery opened up again, it would be time to move forward. A few seconds before 10:00 p.m. at the gun positions the order "Fire" was given. The infantrymen and the Mine Clearing Squads moved forward. 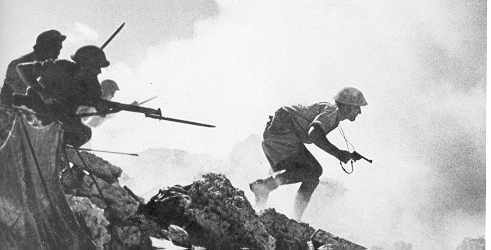 THE BATTLE OF EL ALAMEIN WAS ON! Many made the sign of the Cross, far more said a silent prayer, for they knew they were about to meet the enemy for the first time and perhaps even in hand to hand combat. The outcome is now history, unheard of by some, forgotten by others but remembered by many and rightfully so, for it is one of, if not the most important Battle of WWII which proved to the world, that up to then, the invincible fighting machine of the Axis Powers could be and was soundly beaten. Had the outcome been any different, I doubt whether you would be reading this now. Let me conclude by saying, "WE MUST FORGIVE, BUT NEVER EVER LET ANYONE FORGET the terrible loss of life on both sides during WWII and let us too remember the unpayable debt we owe to those who made the supreme sacrifice. They are not there, they do not sleep. They are the thousand winds that blow. They are the diamond glints on snow. They are the gentle autumn's rain. They are the soft stars that shine at night. They are not there, they DID NOT die. flanked by friends who died in Peace.